For the colour, see Turquoise (colour). 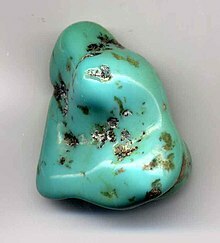 Turquoise is an opaque (cannot be seen through), blueish-green mineral. It is not common and can be valuable in finer grades. It has been prized as a gem and ornamental stone for thousands of years because of its interesting coloring. This page was last changed on 9 March 2015, at 20:34.